This lesson provides general background on the makeup, chemistry, and operation of batteries. Lecture slides attached. If that were the end of the story, the battery would operate for only an instant. After the anode dissolves a little bit, the electrolyte becomes loaded with positive ions, which repel any additional positive ions, preventing them from entering the solution. Similarly, the cathode becomes loaded with electrons, repelling any additional electrons and preventing them from flowing through the wire. In order for the battery to continue operating, positive ions need to be removed from the electrolyte and electrons need to be removed from the cathode. This is where the electrolyte comes in. The most common choice for an electrolyte is some kind of acid (though salt solutions are also used). In solution, some small fraction of acid molecules decompose into two parts, a negative ion, which depends on the type of acid, and a positive hydrogen ion. The negative ion from the electrolyte is attracted to a positive ion from the anode and bonds with it to form a neutral molecule. In the meantime, the positive hydrogen ions combine with electrons at the cathode to become neutral hydrogen molecules. Once the positive ions from the anode and the electrons from the cathode combine with the electrolyte, the anode is free to dissolve a little more and transfer its excess electrons to the cathode. The battery produces more electric current. This process continues as long as the anode continues to dissolve and the electrolyte continues to react with the by-products. Eventually, either the anode or the electrolyte runs out (or the electrodes become coated with gunk from secondary reactions) and the battery quits working. Some specific examples of battery chemistry can be found in our lesson on A Survey of Homemade Batteries. There are three characteristics that describe the performance of a battery. The "voltage" of the battery characterizes how much energy is imparted to each electron as it moves away from the anode and into the circuit, and is measured in volts.1 In essence, it describes the strength of the "push" each electron receives from the battery. The voltage depends entirely on the chemistry of the battery: how easily the anode dissolves and how strongly anode ions and electrons react with the electrolyte. The "current" measures how many electrons flow through the wire in a given time, and is measured in amperes.2 It depends not only on the voltage of the battery but also on the "resistance" of the circuit (how hard it is to push electrons through the wire, or any other electronic element connected to the wire). The "maximum current" describes the current achieved when connecting the battery to a circuit of negligible resistance (like a short length of low resistance wire). This maximum current the battery can provide is influenced by such things as the size and proximity of the electrodes, and the concentration of the electrolyte. It is sometimes characterized in terms of an "effective internal resistance" of the battery, which has to do with how hard it is for electrons to flow out of the battery. The total energy stored in a battery determines how many electrons it can emit (at a particular voltage) before it runs out. The rate at which a battery delivers energy (the "power") is given by the voltage of the battery times the current in the circuit. In lieu of quoting the total energy of the battery, many battery manufacturers quote the "capacity" of the battery: the amount of time it can deliver a particular current, usually measured in milliamp-hours. Some characteristics of common battery types are given in table 1. Table 1: Voltage and capacity ratings of some common battery types. Jeremy at The Custom Geek uses a high voltage system made from a large array of 9V transistor batteries to reek all sorts of havoc on electronic components. Fig. 1: Batteries connected in series. The positive terminal of one battery is connected to the negative terminal of the other battery. Together, they act like a battery with twice the voltage. Fig. 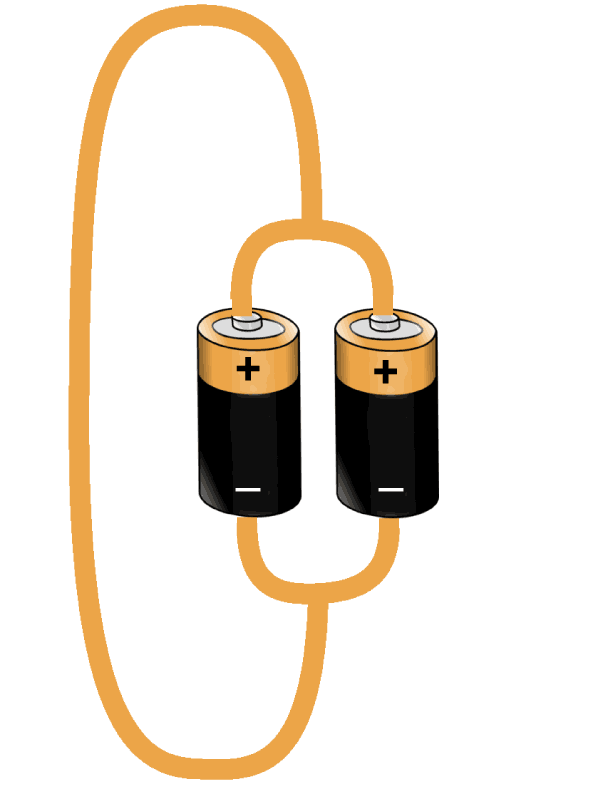 2: Batteries connected in parallel. The positive terminals are connected together on one side and the negative terminals are connected on the other side. Together, they act like one battery with twice the maximum available current. Some electronic devices require more voltage than is supplied by a typical battery. Most light emitting diodes (LEDs) require at least 3 volts to operate. Smoke alarms generally need 9 volts. Electrical devices in cars, from radios to power windows to headlights, are designed to run at 12 volts. So what do you do if you want to light an LED, but all you have are 1.5 volt batteries? The answer is to connect two batteries in "series". Connect the negative end of one battery to the positive end of the other battery (figure 1). Now the connected batteries behave like one big battery with a voltage of 3.0 volts. Remember, voltage describes the strength of the push that each electron feels, and with the two batteries connected in series each electron is pushed twice, once by each battery. Connecting two batteries in series is a little bit like putting two people on your side of the rope in a tug of war. If you need still higher voltage, just add another battery in series. Three 1.5 volt batteries in series gives 4.5 volts. In the video by Jeremy at The Custom Geek (above), hundreds of batteries in series produce a couple thousand volts, enough to destroy many electronic components. As Jeremy emphasizes: YOU SHOULD NOT DO THIS EXPERIMENT AT HOME. Some electronic devices require more current than can be supplied by a single battery. If you connect a tiny 3 volt battery to an LED, you should get the LED to light up, but maybe only very dimly. There aren't enough electrons flowing through the LED to give a bright light; not enough current. 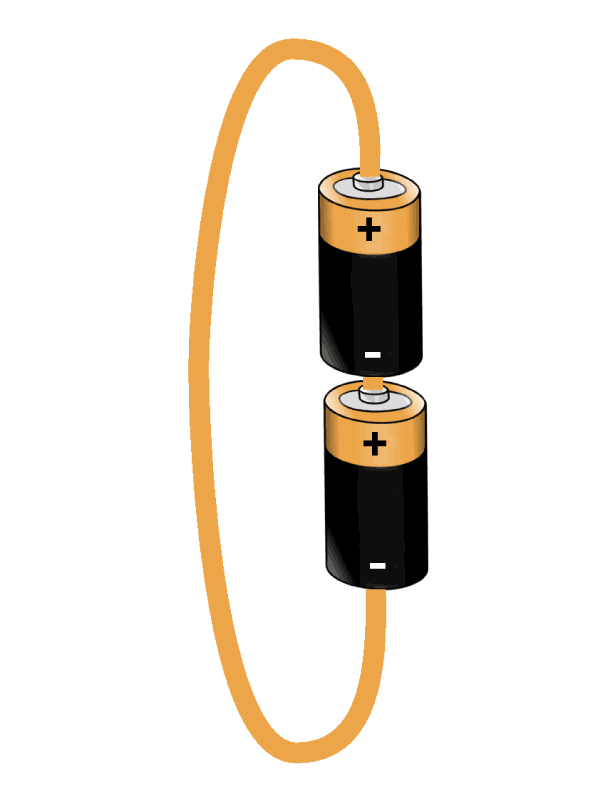 To double the current, connect two batteries in "parallel" as in figure 2. Connect the two positive terminals on one side, and the two negative terminals on the other side. Now the two batteries together act as one big battery that provides twice the maximum possible current. Each electron in the circuit is pushed by only one battery, but twice as many electrons are being pushed. Half of them are pushed by the first battery and half by the second battery. If you need still more current, just add more batteries in parallel with the others. The folks at AllAboutBatteries post tables of battery energy capacity and a timeline of early milestones in battery development. 1. Strictly, the voltage of the battery in "Volts" describes the energy on each electron in "Joules", divided by the charge of the electron in "Coulombs". 2. Strictly, current in units of "amperes" measures how many electrons flow through the wire each second, times the charge on the electron in "Coulombs".